It might sound a little fancy, but braising simply means cooking for a long time, on low heat, in some kind of liquid (usually stock, wine or water). When it comes to meat, the process results in the breakdown of fat and connective tissue, leading to a moist, tender result. Tougher (and cheaper!) cuts call out for the patience braising rewards so well. Here is a basic method that can be applied to almost any combination of meat, vegetables, herbs and liquid. You can use any heavy, lidded pot for this, but enamel or cast iron works best. Brown your meat on high heat in a bit of oil until there is a nice crust on it. You are not looking to cook—simply to sear in the flavor. 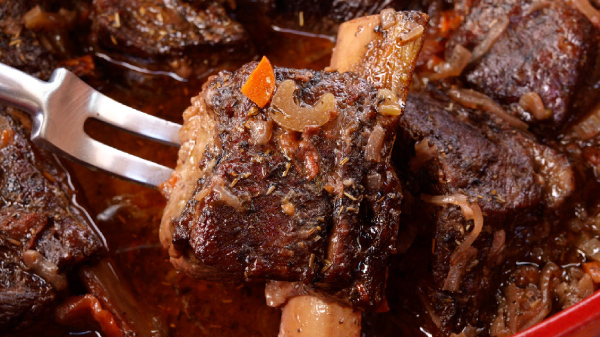 Great meat choices include chicken (legs and thighs work best), short ribs, brisket and lamb shoulder. If you have the choice of bone-in or de-boned, always keep the bone—it’s a treasure trove of flavor. Sauté chopped vegetables (with salt and pepper) until translucent and slightly browned. Options include onions, shallots, leeks, carrots, celery or fennel. If you want to use tomatoes, add them towards the end. Garlic should also go in later to avoid burning. Throw it in when the vegetables look almost ready. Any braise (well, really any dish) benefits from the addition of fresh herbs. At this point, feel free to add fresh rosemary, thyme, oregano or bay. (Dried works too.) Stir until fragrant (1-2 minutes). At this point, return the meat or main vegetable back to the pot. Try to arrange it in an even layer. Add liquid until it almost covers the meat. A half-and-half combination of stock (beef, chicken, vegetable) and wine (white or red, depending on the flavor profile you’re looking for) will yield an intense, earthy sauce, but in a pinch, even water (when mixed with the vegetables and the meat) will lead to a satisfying dish. If you’re braising fish (or artichokes! ), white wine and a splash of citrus is lovely. Bring the liquid to a boil and then turn down to a low simmer. Cover and cook. Cook time will vary from an hour to several hours. You’ll know the meat is finished when it comes apart at the slightest encouragement from a fork. At this point, you can remove the meat and simmer the sauce for a bit longer while it rests. Reducing the sauce will concentrate the flavor.